FAYETTEVILLE, Ark. – Sophomore Autumn Storms collected a win and a save Saturday to help the University of Arkansas softball team to a pair of wins on day two of the Wooo Pig Classic at Bogle Park. The Razorbacks were also aided by home runs from Ashley Diaz and Katie Warrick in the nightcap victory over Saint Francis. With Saturday’s wins, Arkansas improves to 20-5 overall and remains undefeated on its home field. The 2018 Wooo Pig Classic concludes Sunday with two games at Bogle Park including the weekend finale between Omaha and Arkansas. Due to expected rain in the Sunday forecast, first pitch is now scheduled for 10:30 a.m. (CT). The game will still be streamed on SEC Network+ which is also available through the WatchESPN app. In the team’s first game of the day, Diaz pushed the Razorbacks’ lead to three with a two-run single in the home half of the fifth inning. Sydney Parr and Autumn Buczek led off the frame with a walk and single, respectively, and eventually rounded the bases to score on the Diaz hit. Parr scored the first run of the game, an unearned tally in the third plated by an RBI hit by Hannah McEwen. Storms turned in a complete-game performance on her way to earning her eighth victory of the season. She scattered five hits and allowed just one run in seven innings of work while striking out five Omaha hitters. After keeping the visitors off the scoreboard through five, Storms gave up and RBI single in the sixth. However, the Temecula, Calif., native retired the next six hitters to secure the win. After a scoreless first frame, Warrick led off the bottom of the second with a solo home run to right center. The homer was her third of the weekend and fourth in the last five games. Sophomore Aly Manzo followed Warrick with a triple and scored on an RBI double by Krzysko to add the Razorbacks’ second run of the frame. Saint Francis scored a run in the top of the third inning but one swing of the bat by Diaz pushed Arkansas’ lead to 4-1 in the home half of the inning. With McEwen on second after a lead-off double, Diaz drove a two-run shot off the light pole in left center. The home run was her fifth of the season and 20th of her career. Diaz ties Dayna Huckabee (2005-08) for ninth place on the program’s all-time list. The Razorbacks maintained their three-run advantage until the sixth inning when the visitors pulled to within one thanks to a two-run dinger off starter Mary Haff. 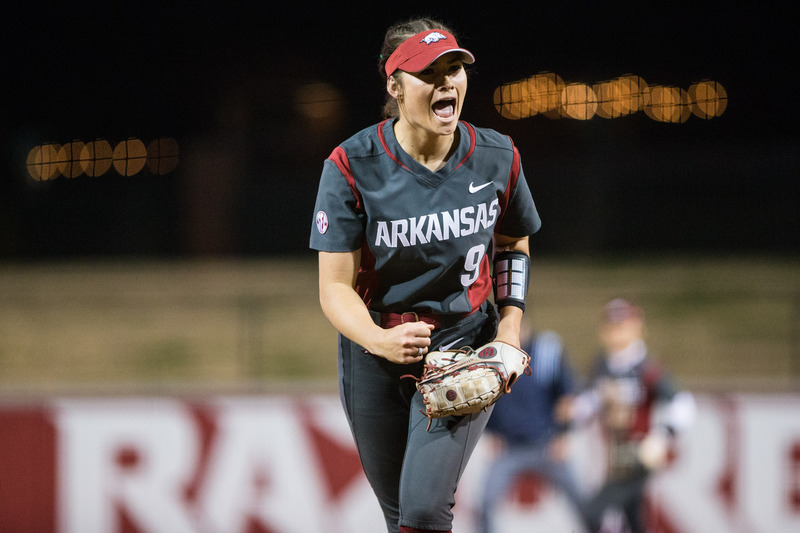 The Razorback freshman retired the next hitter and was then relieved by Storms who struck out three of the five hitters she faced to post her second save of the season.